News — Cheney Lake Watershed, Inc.
Jeff Brawner, right, examines his soil structure in an irrigated grazing system. Grazing cover crops is not a new concept, but a common frustration can be the lack of consistent rain to germinate and grow the crop. What if we could plant cover crop mixes under irrigation specifically for grazing? That was the question Haven, Kansas producer, Jeff Brawner, set out to answer in 2018. To start, Jeff had to determine what crops would be good for grazing while improving the health of his soil. 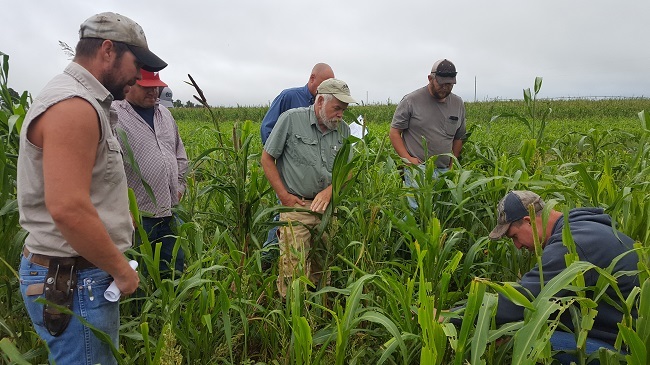 Early in 2018, Jeff planted a mix of rye, buckwheat, flax, safflower, crimson clover, mustard, triticale and oats on 160 acres under a center pivot. In March he moved his cow herd onto the covers allowing them to graze only small paddocks of fresh forage every day. He grazed that mix until June and then planted a mix of BMR sorghum sudan, Hybrid Pearl Millet, Brown Top Millet, Red Ripper Cowpeas, Laredo Forage Soybeans, Sunn Hemp, Okra, Buckwheat and Peredovik Sunflowers. He began to graze the summer mix with 170 pairs in August and removed them mid-October. Jeff says that it takes daily moves to make the system work but he would rather move fence to feed his livestock than feed them in a dry lot at a bunk. It takes him 40-60 minutes to move the fence versus 2 hours to mix feed and haul it to the cows. Providing water in a rotational grazing system is often a challenge since the cattle are always on the move. Jeff uses a plastic barrel cut in half with a float and flexible pipe to provide water for the 170 pairs. At first, I wondered how one half of a barrel could provide water for that many head until Jeff explained that the key is to never let them run out of water. When the cattle have water constantly available they are willing to take turns drinking rather than rushing the water source with lots of pushing and shoving. Jeff says the grazing system uses about half the irrigation water needed for a cash grain crops. This saves pumping costs as well as conserving water. To me it makes sense to let the cows harvest their own forage rather than baling or chopping the forage and bringing it to the cows. There is a reduction in the amount of equipment needed for harvesting and feeding. While the cattle are out grazing in the field they are spreading their own manure whereas in a dry lot we have to scrape and haul manure. Also, with cattle lying on cleaner soil the invitation to environmentally-induced disease is lower. I know that in my days as a dairy farmer I was amazed that my cows would rather go out in the field to bed for the night than go to a nice clean stall barn even if there was snow on the ground. And not least, putting livestock on crop fields helps build a strong biological system in the soil for future crops. Many farmers are finding that going against what nature wants requires lots of effort and resources and it has occurred to me as I write this that maybe penning up cattle and feeding them at a bunk is one of those going-against-nature practices. I think maybe Jeff is onto something. He will freely admit that he hasn’t got it all figured out but at least he’s trying to learn a better way. In fact, he is already planning his next project - perennial cover crops for grazing on dryland. The challenges for grazing dryland will be different but maybe the bottom line will be better since there is no irrigation cost. Jeff’s ability to think outside of the box is what makes him successful. I leave you with this challenge from Steve Groff, the Cover Crop Coach, “Try new things on at least 10% of your farm”. Why not try this with at least part of your farm and part of your cattle? What have you got to lose?